Copenhagen Aiki Shuren Dojo accepts new members throughout the year. Training at Copenhagen Aiki Shuren Dojo runs 12 months a year, with a summer/fall training schedule, in September the regular schedule resumes. Beginners also have the opportunity to participate in morning classes Mondays and Fridays from 9:30 – 10:30. The monthly fee is 350,- DKK for adults and 250,- DKK for the Children’s Aikido group. The policy of Copenhagen Aiki Shuren Dojo is that classes are taught in English if there are people attending who do not speak Danish. Copenhagen Aiki Shuren Dojo beginners’ classes consist of initial stretching and warm-ups, body movement training, basic rolling and falling training (ukemi), and easy to follow, step-by-step training in basic techniques. People are able to enter these classes at any time throughout the year. As a beginner, you will be given special attention by the instructors. To begin with, you can train in any kind of loose-fitting outfit, or training suit. Keikogi (training outfit – basic judo/karate gi) can be bought at the cost of approx. 350,- DKK. 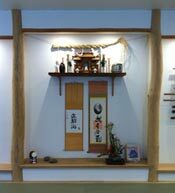 Shuren Dojo instructors will be of assistance regarding the purchasing of a suitable keikogi.